Today I have added another wash of Aureolin Yellow to the coconuts. 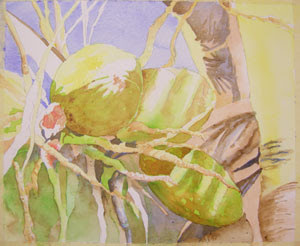 By leaving some of the sparkling white of the paper, I can show the crisp light shining on the coconuts. Glazing the yellow over several areas creates a subtle warmth and shower of sunlight to this piece. I glazed some yellows onto vine areas above and below the coconuts. Vary the edges for interest and depth. You can paint along with this lesson if you would like. To get the pdf file of the reference photo and the drawing, go to my etsy online store, click on the Online Class icon, and let me know you would like the coconuts lesson. For $5.00 you get the drawing and references, and you can follow along with the lesson as we go.